Western gorillas live in lowland, swamp, and montane forests from sea level to 1,600m, have the largest home ranges, up to 20km², and travel the farthest of all gorilla subspecies because of their reliance on fruit. They have been seen to use food tools in the wild, and in captivity they show the capacity to learn basic human language. Despite being the more numerous and widespread gorilla species, the severe threats of hunting, infectious disease and habitat loss Western gorillas are at a greater risk of population collapse in 30 years. The Western gorillas and the Eastern gorillas are more genetically distant from one another than are chimpanzees (Pan troglodytes) and bonobos (Pan paniscus)! The family Hominidae comprises seven living species in four genera: Homo (humans), Gorilla (gorillas), Pan (chimpanzees) and Pongo (orangutans). Apes are thought to have diverged from Old World monkeys around 20 million years ago. For most of the twentieth century it was thought that there was a single species of gorilla with three subspecies; the western lowland, the eastern lowland and mountain gorillas. However, with DNA analysis it became clear that the significant differences were between eastern and western population rather than lowland and mountain gorillas. These forms were so distinct that they were reclassified as separate species. Today, the western gorilla (Gorilla gorilla) consists of two recognized subspecies: Gorilla gorilla gorilla (western lowland gorillas) and Gorilla gorilla diehli (Cross River gorillas). The taxonomic status of the gorilla populations in the Maiombe Forest (Cabinda, Democratic Republic of Congo and Republic of Congo) and in Ebo/Ndokbou (Cameroon) awaits clarification. Western gorillas are found in Cameroon, Central African Republic (CAR), mainland Equatorial Guinea (Rio Muni), Gabon, Nigeria, Republic of Congo (RoC), Cabinda (Angola), and possibly in the Democratic Republic of Congo (DRC). 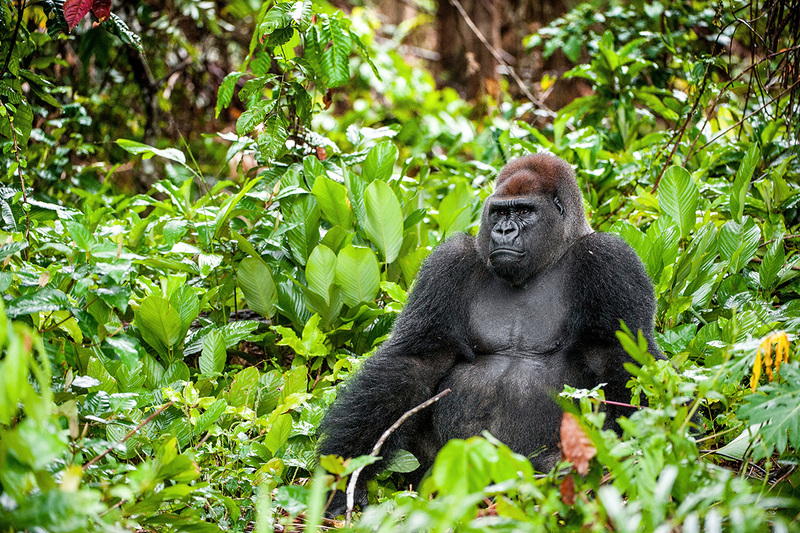 Western gorillas are found primarily in lowland tropical forest, both primary and secondary, particularly where there is dense ground-level herbaceous growth, and in swamp forests. Staple foods are pith, leaves and shoots. The fruit component of the diet is generally high but varies with seasonal availability. Insects also form an occasional component, when they can be caught. Like other subspecies of gorilla, the Western lowland gorilla spends most of its time on the ground but will climb trees to feed on ripe fruits and make a sleeping nest. Gorillas live in groups averaging 10 and occasionally 20 individuals, composed of at least one adult male, several adult females and their offspring.